The CS106, manufactured by Vaisala, measures barometric pressure for the range of 500 to 1100 hPa (mBar). This range equates to from below sea level (as in a mine) to over 15,000 feet above sea level. Designed for use in environmental applications, the CS106 is compatible with most Campbell Scientific data loggers. The CS106 has an attached 76.2 cm (30 in.) cable. The CS106 uses Vaisala’s BAROCAP silicon capacitive sensor to measure barometric pressure. It is encased in a plastic shell (ABS/PC blend) fitted with an intake valve for pressure equilibration. The CS106 outputs a linear signal of 0 to 2.5 Vdc, which allows the barometer to be directly connected to a Campbell Scientific data logger. An internal switching circuit allows the data logger to power the CS106 only during measurement, which reduces power consumption. A 2.5-ft cable is supplied with the sensor for connection to the data logger. 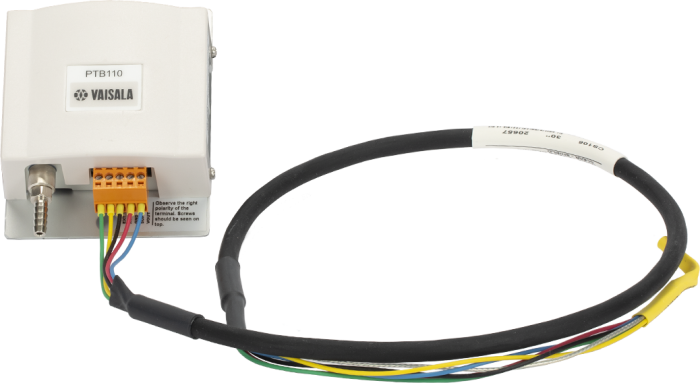 The cable connects to a control port, single-ended analog input terminal, 12 V power terminal, and ground terminal on the data logger. The CS106 is typically mounted next to the data logger inside an ENC12/14 or larger enclosure. The very small ENC100 is available for housing the CS106 separately, in its own enclosure. Why might measurements with a CS100 or CS106 be bouncing (noisy)? The sensor was not allowed to warm up adequately. The sensor is placed in an electrically noisy environment, which makes other analog measurements noisy. What is the warm-up time for the CS100 or CS106? Can a CS100 or CS106 be used to measure pressure in an application at very high humidity without damaging the sensor? The sensor resides in a non-condensing environment. The vent tube accessing the high humidity environment is extremely well desiccated to keep any moisture from reaching the sensor’s components. Moisture in the sensor will damage the sensor, often to an un-repairable state. Does the CS100 or CS106 fit inside an ENC100 enclosure? Either the CS100 or the CS106 can fit inside an ENC100. For more information, refer to the Specifications information on the ENC100 product page. Does the CS100 or CS106 need to be vented to the outside of an enclosure or building? In most cases, enclosures and buildings have enough little spaces for the pressure to stay at equilibrium with the outside pressure. Therefore, the sensor does not need to be vented to the outside. It is possible, however, that the rate at which the pressure equalizes is slowed by being in an enclosure, but the rate change usually is not noticeably significant. If the sensor resides in an absolutely air-tight environment, and the pressure outside this environment needs to be measured, then the sensor will need to be vented to the outside. However, venting to the outside may change the rating of the enclosure or associated inside environment. How often should the CS100 or CS106 be factory calibrated? The manufacturer recommends calibration on a yearly basis. However, conformance to published standards or regulations may require this on a more frequent basis. For a reading in millibars, the multiplier is 0.240, and the offset is 500. To convert the millibar reading to different units, add an equation to the code. To correct the pressure to sea level, see the “Correcting Pressure to Sea Level” section in the CS100 instruction manual or in the CS106 instruction manual. Alternatively, use Short Cut for Windows to generate the program, and, when prompted, enter the appropriate site elevation.